John T. Rosborough bought the C.C. Burrell & Son Agency / George Mahoney Agency in 1952. These entities were in the insurance business dating from the early 1800’s and were the oldest active agency in the state of Maine. J.T. Rosborough, Inc. then moved to 71-73 Main Street and in 1976 moved to our present location at 214 Main Street. This location is a completely renovated Victorian home that is listed on the Historic Register. The sons of John T. Rosborough; Mark and Duncan, became the owners in 1985. Mark Rosborough continues to be active in the business to this day. In 1996 the J.T. 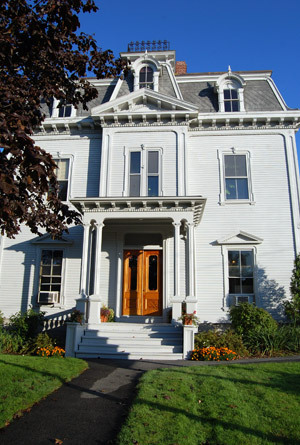 Rosborough Family was awarded the Top Drawer Award from the Ellsworth Chamber of Commerce in recognition of their contribution to the growth and development of Ellsworth, the county of Hancock, and the state of Maine. J.T. Rosborough, Inc. is a full service insurance agency providing coverages for our more than four thousand clients through our Life and Health department, business insurance for local businesses and a full range of Personal Lines coverage for homes, automobiles and recreational needs of our clients. We currently employ 14 qualified professionals who are committed to providing for the insurance needs of our customers. We, the associates of the J.T. Rosborough Agency, are committed to providing our valued clients with tailored comprehensive Insurance Programs and Services. Our professional team strives to offer unparralled service. We insist our relationships be conducted with mutual trust, respect and integrity. In achieving these objectives, we focus on continuous improvement of all associates and of our full range of insurance services, risk management and employee benefits. Our goal is to be the agency of choice for all insurance needs, while maintaining a financially sound position to benefit all.